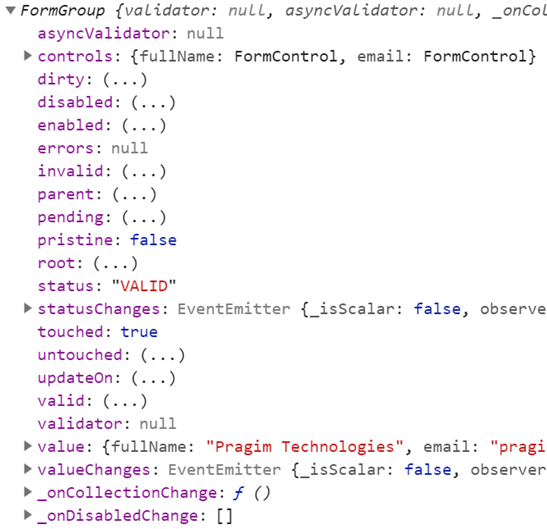 When working with reactive forms we create instances of FormControl and FormGroup classes to create a form model. To see the form model we created using FormGroup and FormControl classes, log the employeeForm to the console. On Save button click, you should see the following form model in the browser console. 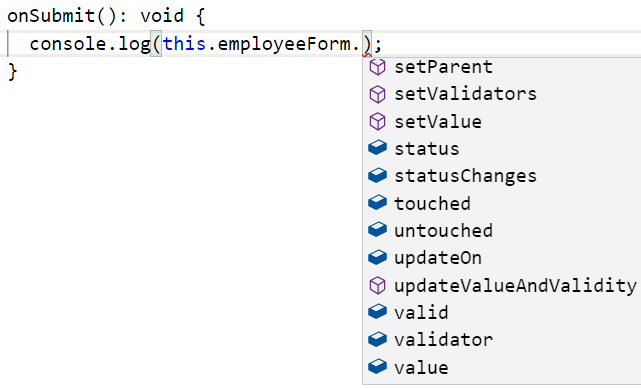 To access the FormGroup properties use, employeeForm property in the component class. When you press DOT on the employeeForm property you can see all the available properties and methods. To access a FormControl in a FormGroup, we can use one of the following 2 ways. Note: This same code works, both in the template and component class. Please include the following HTML, just after the <form> tag, in the template, and you can see the property values change as you interact with the form controls on the form. In addition to these properties, AbstractControl also provides the following methods. In our upcoming videos we will use these properties and methods for form validation and working with data.